All Bibles are revised and updated. That’s why there is the King James and the NEW King James, the New American Standard and the New American Standard 1995 revision. WASHINGTON, D.C., JAN. 10, 2011 (Zenit.org).- A revised translation of the New American Bible, which aims to be more accurate, will be released March 9. The U.S. Catholic Bishops’ Conference announced the forthcoming publication of the New American Bible, Revised Edition (NABRE), which was approved last Sept. 30. This revision, the most extensive in the past 20 years, reflects advances in linguistics of the biblical languages, new discoveries of ancient manuscripts, and changes in the English language. 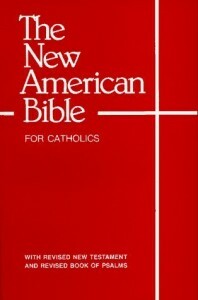 The bishops approved the NABRE for private use and study, though they noted that it was not be used for the Mass, which uses an earlier version of the New American Bible translation. You should check out the NABRE on saintbenedictpress.com. It is well done with several options for covers. Next post: Exciting, Spiritual Pilgrimages in 2011 & beyond – Join us! !